The Best Power Rack For Your Home Gym | Build More Muscle in 2019! ​When it comes to ​getting in shape and having an effective workout at home, a decent power rack can make all the difference. With a power rack you are able to do compound exercises effectively and safely. But which power rack should you buy? ​When looking for a power rack you should keep in mind the amount of space you have ceiling height, and what size power rack would best fit your home gym. ​Keep in mind that the bar will stick out about a foot on either side of the rack, along with any accessories you plan to install. Power racks come in different sizes, so you will be able to find one that fits perfectly ​in that home gym. ​Just like power racks come in different sizes, they also come in different weight capacities. If a power rack has a weight capacity of 800 pounds, it doesn't necessarily mean you can safely lift 800 pounds. For example, if you squat 800 pounds and you fail a rep and the weight comes crashing down onto the frame of the power rack you can easily damage it because the force will be greater than 800 pounds. Same thing with re-racking weights, you might be able to damage the rack if you put the bar back too hard. Another thing to keep in mind is that the safeties on the rack might not be able to support the full 800 pound weight limit. So it's important to keep and eye on these things when searching for a power rack. A general rule of thumb is to go with a power rack that is double your weight lifting goals. So if you want to squat 405 for example, you'd look for a rack that can support 810+ pounds. ​Next to look out for is accessories. 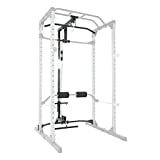 Some power racks come with lat-pull downs, dip stations and some even have a smith machine. You need to decide what kind of exercises you want to do and how much you are willing to spend. Adding accessories will bring the price up but will allow you do a wider variety of exercises. Want to do squats? Maybe military press, deadlifts or even bench press? This is all possible with a power rack. ​Power racks are one of the most versatile and foundational pieces of equipment for any home gym. You won't be able to do every single exercise out there but you will be able to do the important heavy barbell movements and depending on attachments, you can add even more variety like pull-ups, dips or lat pull-downs. If you train alone you may not have the benefit of having a spotter to help you if you fail a rep on the bench press or squat. Luckily, a power rack comes with a set of adjustable safety catches allowing you lift more safely and avoid possible injuries. ​Like most gym equipment, if you buy a quality power rack it will last you a very long time making it a great investment if you plan to train at home for a while. What is a squat stand? A squat stand is similar to a power rack but instead of having 4 support posts it only has two. This can be a problem if you are lifting by yourself because the weight will not be supported like it would within a power rack. Power racks offer better stability and safety than a squat stand. Since squat stands only have two supporting posts, heavy weight can tip it over and possibly cause injury. ​Below you will find our top power rack picks ranked by price. 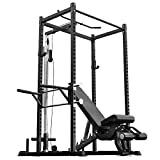 ​The Rep Power Rack PR 100 is one of the most popular power racks available on Amazon. This power rack comes with a variety of optional upgrades such as lat and dip attachments, as well as an adjustable weight bench. ​In terms of weight capacity this power rack is rated 100lb on bar hooks, 400lb on pull-up bar and 400lb on the dip attachment, allowing for just about as much weight as you can throw at it. How much space does this rack take up? Well it is 83"(height)x48"(width)x48"(depth) so if you have a low ceiling it may not be ideal and their 72" tall version may be better. Overall this is a quality power rack with multiple attachments allowing for a variety of exercises and features a strong sturdy frame. One drawback is that the company does not include assembly instructions. ​Next on our list we have the Fitness Reality X-Class Power Rack, another popular choice on Amazon. This power rack features adjustable dip handles, dual mounted safety bars and a multi-grip pull-up bar. You can also choose to purchase their lat pull-down attachment that will allow you to do more exercises. ​Inside the box you will also find ​a bonus pair of J-Hooks which is a nice addition. ​In terms of weight capacity this power rack has a capacity of 1500lb, with a 600lb weight capacity on the pull-up bar and dip handles. ​This rack is quite tall with a height of 86" so if you have a low ceiling this rack may not be the best option for you. Overall this is another solid power rack option and features a sturdy build with a heavy weight capacity. The provided assembly instructions are clear and the provided J-Hooks are well built. Highly recommended. 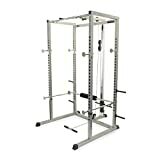 ​The Valor Fitness BD-7 is another quality power rack on the list​. The frame on this rack is sturdy and it works great for pull-ups. This power rack is also easy to assemble and comes with clear instructions aimed to get you moving some weight as fast as possible. In terms of attachments this rack comes with a lat pull attachment and has a low pulley station for upright and seated rows. Once assembled this power rack has a max height of 82.5" so it should fit standard ceilings, however, if you have low ceilings always measure first before buying. This rack can handle some good weight, you are looking at 500lb for the bar catchers inside the cage and 650lb for the outside. The safety bars can handle up to 800lb, so this should be more than enough for most people. 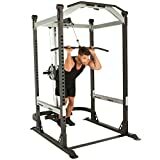 Overall this is a decent rack, solid build quality and comes with attachments that can add a lot more variety to your workouts. Another highly recommend rack. ​The TDS power rack ​is another quality power rack available from Amazon​ that features a simple and heavy duty design. It has all the basics you need to get a quality workout at home. This power rack also features a professionally knurled front chinning bar that can be ​used to add attachments, so you can add some more exercises into your routine. In terms of weight capacity, this power rack has a 1000lb weight limit for the whole unit so this will be perfect for those looking to get stronger as well. This power rack is one of the shorter ones on our list at 72" tall with a more or less square bottom of of 48" by 48.5"
Overall this is a decent rack, build quality is great (especially for the money) and has good reviews on Amazon. If you are looking for something that fits the budget and keeps things simple, then this rack is for you. ​Last but not least we have the Fitness reality 810XLT. This is one of the best budget power racks out there and features a sturdy and functional design. the base is stable and you won't have any problems doing heavy rack pulls. In terms of rack size, the Fitness reality 810XLT is 83.5" tall and is fairly easy to assemble. If you have a low ceiling then this might be a bit too tall for you. ​When it comes to weight capacity, the 810XLT is only suited for a max of 500lbs, so this rack would be better suited for those who are just starting a workout program or intermediate lifters. Overall this is a solid budget power rack choice for beginner and intermediate lifters. ​Hopefully you now have a better idea of what to look for in a power rack​. Going with any on the list will be a solid choice, it just comes down to your budget and what you prefer. If I had to choose one rack from the list I would go with the Valor Fitness BD-7.